I can’t say the name of this recipe without developing a Filipino accent. I was born and raised in the United States and don’t have a trace of a Filipino accent (which kind of bums me out). But for some reason when I say “Chicken Barbecue”, there it is. I suddenly become a Manila Mama and it comes out like, “Cheeken Baar-beh-kew.” My fellow Pinoys, you know what I’m talking about. 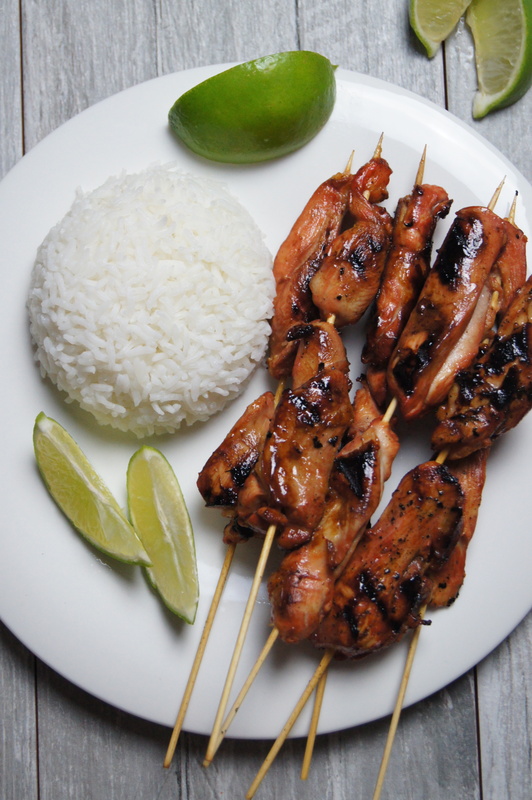 Every Filipino has their own recipe for chicken barbecue. But for the most part the ingredients that I’ve made mine with here are the essential ingredients that most Filipinos use. I’ll probably experiment more as time goes on and will definitely share any variations of this recipe with you. I’ll be honest, this is my first try at winging this recipe because my go-to recipe before was the bottle of Mama Sita’s Barbecue Marinade, which is really amazing by the way. 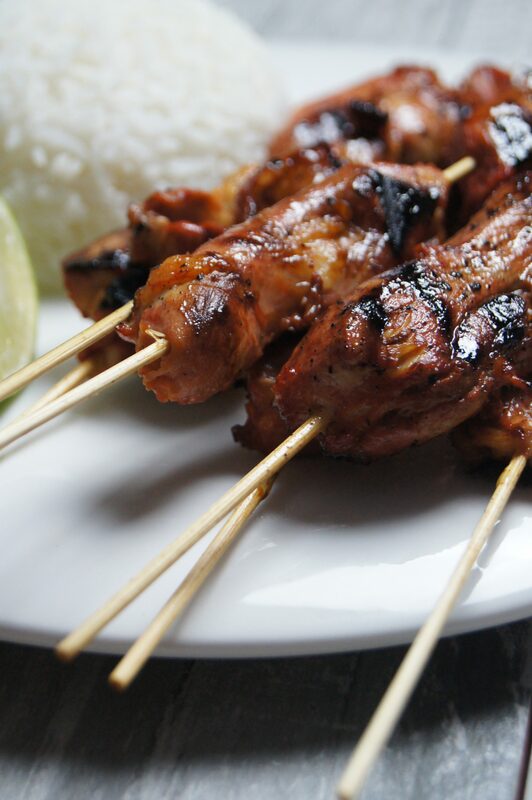 Filipino barbecue – whether it be chicken or pork – is one of those things that you will have once and need to have many more times again. Not only because it tastes so good, but is a reminder of happy times and happy get-togethers with family and friends. That’s the experience for most, if not all, Filipinos. One of my favorite memories of Filipino barbecue is one that also makes me laugh. I was 23 and it was a couple of months before I got married (seriously, I was a baby!). I was living at home and hanging out with my parents and older sister, Jocelyn, one Friday night. (I have a younger sister, Joanna, but she was away at college at the time.) We were watching a show that was all about Filipino food and at that moment all we wanted was to go to a Filipino restaurant and have barbecue and lechon (roasted pig) . Being in Boston, we didn’t have (and pretty much still don’t) have the luxury of having a good Filipino restaurant around. I mean, my mother could make what we were seeing on TV and craving, and it’s all incredible, but where were we going to get a whole pig to roast at 7:00 on a Friday night? The closest place that we could get good Filipino barbecue and lechon was Roosevelt Ave. in Queens, NY. And because Filipinos are determined, we hopped in my parents’ minivan, with its beautiful wood paneling, and drove to Queens. We couldn’t leave Joanna out of our adventure. So we picked her up in Amherst, which was a good couple of hours away. See the Filipino determination? Despite the distance and hours spent in the minivan, it was so worth it. Not only because of the food, but for the time spent with my family before I went away and got married. And by “went away”, I mean, I was moving a whole 15 minutes away from my parents’. 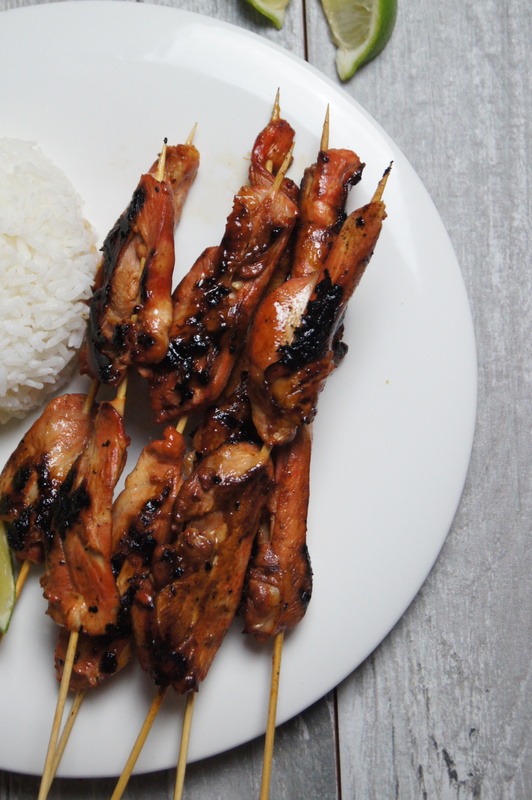 But you don’t have to go to Queens – or even Manila – to enjoy good Filipino Chicken Barbecue. This recipe will save you a trip and make your taste buds happy. One bite, and I was back on Roosevelt Ave. In a large bowl, combine all ingredients, except the wooden skewers. Cover with plastic wrap. Refrigerate and marinate the chicken overnight. 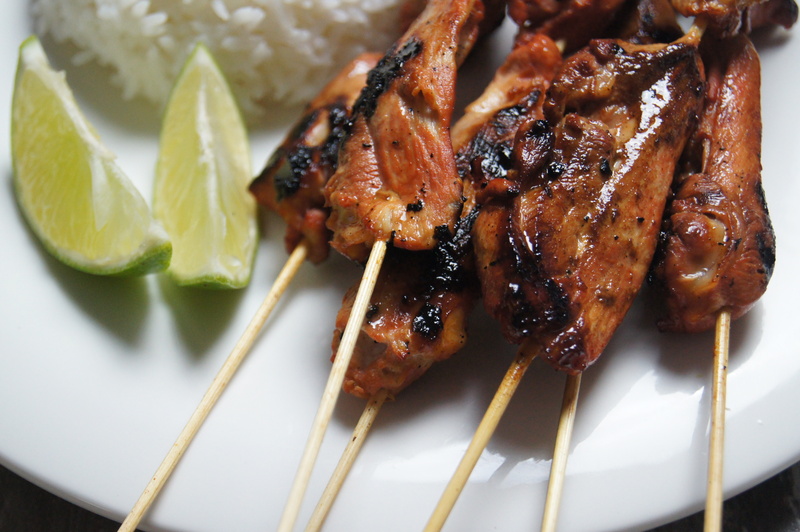 Skewer the marinated chicken. Reserve the marinade in the bowl. Prepare a grill over medium-high heat. Place chicken on grill and baste with the reserved marinade. Grill on all sides until fully cooked and you have a good char, about 10 minutes.